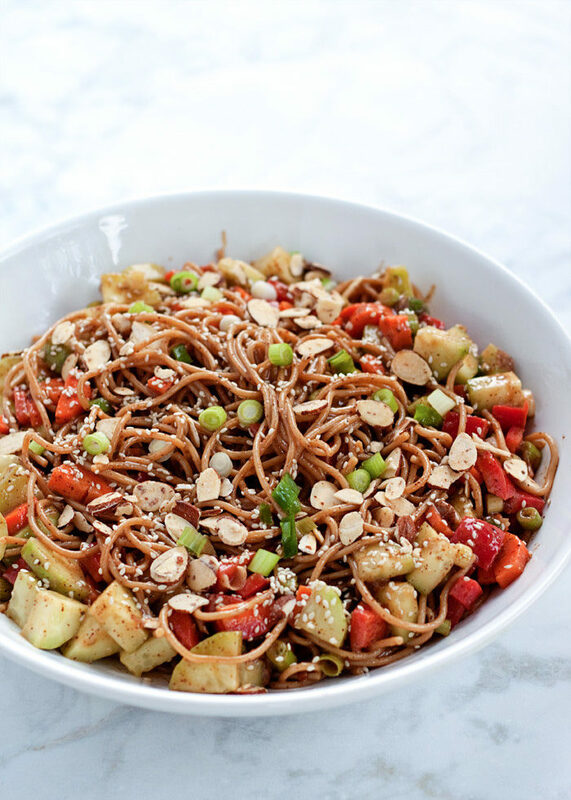 This cold pasta salad is packed with refreshing cukes, carrots, sweet bell peppers, and scallions – then drenched in a creamy almond-butter sesame dressing. Make it ahead of time for easy lunches, dinners, or picnic and potluck fare. What is it about eating dinner outside that is so … well, kind of magical? From the first meal of the season around the patio table to the perfect picnic on a blanket at the park, it elevates the simplest meal into something special. Making the decision to go al fresco with your meal is the easy part. Finding something that’s delicious cold – AND portable, if you’re picnicking it – can be a little tougher. 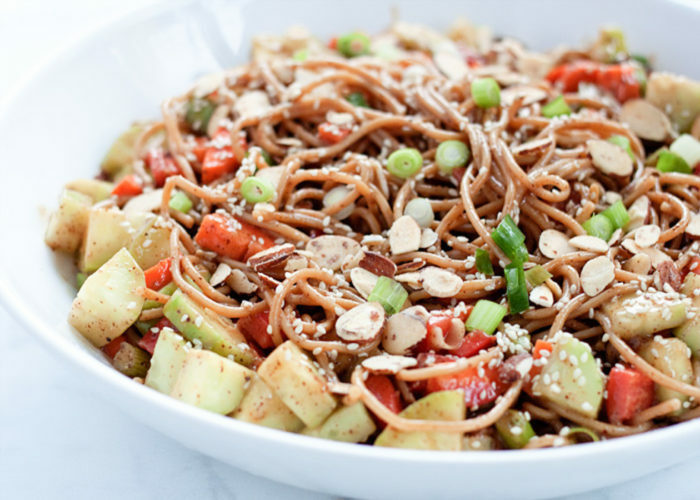 That’s why I love recipes like these Veggie-Loaded Sesame Almond Butter Noodles – just whip it up ahead of time and enjoy it chilled later on. 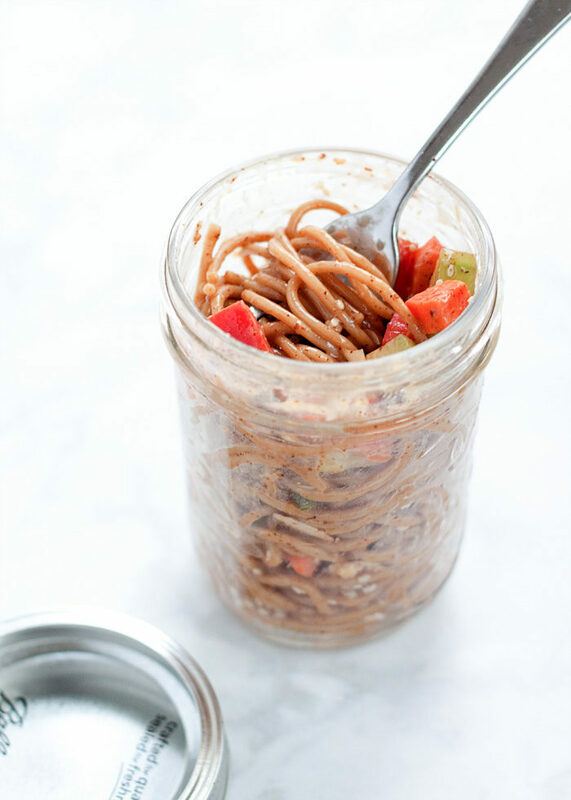 For these sesame almond butter noodles, I love putting individual portions right in mason jars for the easiest transport and serving. The pasta, veggies, and almond-butter based sauce makes for a complete yet simple main that everyone on the blanket will dig. 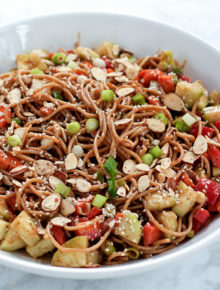 This recipe is a riff on my Veggie-Loaded Peanut Butter Noodles, one of my favorites. It’s essentially the same recipe, but with almond butter swapped in for the peanut butter, and a few sliced almonds added in for crunch. Not just for picnics, this recipe is also perfect as a make-ahead weeknight dinner, or a great meal-prep situation for easy grab-and-go lunching. I think it might also work well for kids’ lunches, especially if peanut butter is a thumbs-down at school. No matter why you cook ’em, be sure to take them outside to eat. It’ll taste even better. Truth. Cook the pasta according to package instructions. Drain and add to a large bowl. Add the cucumbers, carrots, pepper, and scallions to the bowl too (reserve a few for garnishing). Make the dressing: Add all of the Sesame Almond Butter Dressing ingredients to a small bowl and whisk briskly until blended. If the dressing seems thin, add a little more almond butter. If too thick, you can thin it out with a bit of water. Pour over the veggies and pasta. Using salad tossers, tongs, or two wooden spoons, toss until well-combined. 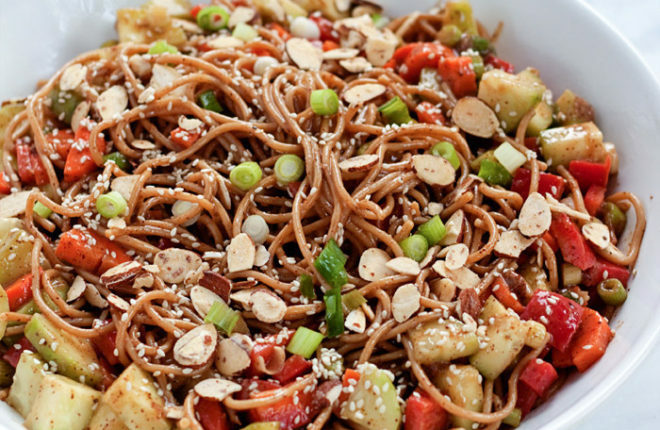 Top with roasted almonds, toasted sesame seeds, and remaining scallions. Serve immediately or chill to eat later. Keeps well in a sealed container in the refrigerator for about 3 days. * To toast sesame seeds, place them in a saute pan over medium heat and cook, stirring constantly, until fragrant and light brown, 4-5 minutes. Sub brown rice pasta for the wheat pasta. This has so much good and healthy stuff. Thank you for the recipe.